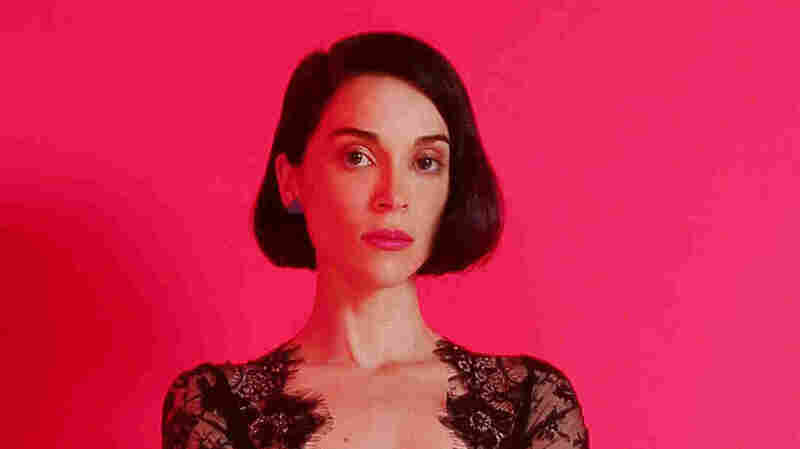 St. Vincent On World Cafe : World Cafe With only an acoustic guitar in hand, Annie Clark pulls off an in-studio performance in spades. Up on stage, St. Vincent looked like she should be on the cover of Sports Illustrated: Swimsuit Edition meets Guitar World Magazine, 1,000 years in the future. Picture latex bodysuits — one bright pink, one spaceship silver — and thigh high boots. The kind of outfit that on anybody else might look a certain way, on St. Vincent looks like pure power. There were fluorescent colors all around, video projection screens and a different neon guitar for what seemed like every single song. She performed two sets. The first was made up of more theatrical interpretations of some of her older songs. And then, after an intermission just long enough to peel off one latex outfit and put on another, she played her entire new album, Masseduction, from start to finish. Later this year, St. Vincent plans to take a band out on the road. But when I saw her, there were backing tracks filling in all the parts while St. Vincent sang and shredded like a monster on guitar with a magnetic degree of stillness and control over jagged movements that came just at the right times. Listen in the player above to hear her pull it off in spades. You'll also hear our chat about power, pills, paparazzi and depression, with a healthy dose of St. Vincent humor.